You know that feeling when you sit down to a play a game without really knowing what to expect, and then are immediately blown away by the cleverness of the mechanics, the scope of gameplay, and the overall experience you have that brings joy to your little tabletop gaming heart? I hope so. It feels pretty good and you each deserve that moment. 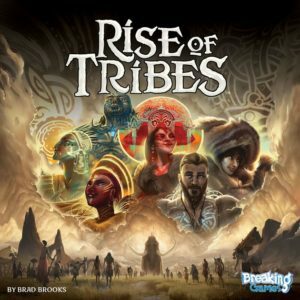 To give you an example, you might want to check out Rise of Tribes by Brad Brooks and published by Breaking Games. I was introduced to both the game and designer at a local board game prototyping event, and I haven’t been able to shut my mouth about it since. Seriously, you should already be driving to your FLGS to pick up a copy. Rise of Tribes is all about bringing your people to greatness. To begin, each player chooses one of the Tribes, and in the advanced game, picks one of that tribe’s two Leaders. You lay out a series of hexes representing Lakes, Forests, and Mountains, where your tribe members might gain Food, Wood, and Stone. You get two actions per turn, choosing to Grow your tribe, Move around the board, Gather new resources, or Lead your way to new opportunities. From there, you race against the other players to construct villages, research new technologies, and achieve goals for your tribe to do what every civilization in history has ever wanted to do—collect Fifteen Victory Points. Okay, so you may think this sounds a lot like Twilight Imperium or Sid Meier’s Civilization or a host of other games with similar themes. What sets Rise of Tribes apart for me is a dedication to two particular mechanics. One makes the game infinitely more fun than any other area control game I’ve played, and the other is an intriguing twist on the Tragedy of the Commons. Let’s start with fun! Have I mentioned how much I dislike Risk? It’s a game we all need to play, but the idea of moving huge units around and rolling dice in a very random way… you’ve heard the arguments before, I’m sure. It isn’t fun for me. In fact, I don’t really enjoy games where combat is a necessary path to victory, because I don’t think zero-sum games are a ton of fun for everyone throughout the game. If your gain comes from my loss, I’d rather play Scrabble. Scythe was a great example of a game where some battle was needed, but very quickly, players stopped gaining points for fighting! Two victories, and you could tell your military to take a nap. In Rise of Tribes, players can be on the same hex space as much as they want. As they peacefully coexist in the same space, both players can utilize that hex just as if they were the only ones there. They couldn’t choose to attack each other, even if they wanted to, without a good reason. Which in this case is defined by population. Each hex has a population limit of five tribe members. 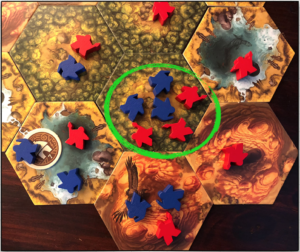 Which means that on this board, the Red and Blue players coexist in all spaces just fine, but someone messed up in the circled Forest space. Here, the population has hit a critical level and Mother Nature needs to step in. Do we roll dice? Draw cards? Play Rock, Paper, Scissors? Slap Jack? Nay. Instead, every tribe loses one of their members in that hex, and that process continues until only one tribe remains. In this case, since the two sides are even, all six tribe members are lost. Welcome to the brutal truth that combat is bad for both sides. More importantly, combat itself is never worth Victory Points. It may help a tribe achieve its Goals, but combat for its own sake is never something that helps you progress. By simplifying combat and making it such a huge penalty for both sides, players shy away from it unless they must battle to complete a goal. Even then, since all goals are public information, every player can see the battle coming and decide how they plan to respond. I love the flow of combat, but what draws me to Rise of Tribes is an ingenious way to choose your actions each round. Place your die to the left, push the action dice, remove the last one. This strategic planning mechanism is just so satisfying! 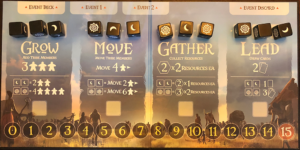 At the start of the game, you set three dice to specific faces above each potential action in the game—a Sun, then a Moon, and finally a Blank face. At the start of your turn, you roll the remaining two dice and consider your options. For your first action, you choose one of your dice and place it to the left side of the action’s dice. 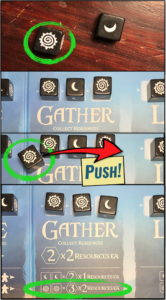 Then, you push them all to the right, putting your dice into the left-hand space, and removing the far right one from the action. Finally, you see how lucky your action is going to be. If the board shows two Suns, you get the best possible outcome. If it shows two Moons, you get the worst. Anything else is the normal action. This means that on a lucky day, you grow your tribe by twice as many members than on an unlucky day. Your tribe can move farther and gather more, as long as that sun keeps shining down. It’s a beautiful, thematic mechanism that gives the game a healthy dose of intrigue and strategy. As the game progresses, you soon begin to realize that your turns are affected by the players who have gone before. If everyone before me left Suns on an action, then no matter what I place, I’ll have a good day! Well, hold on. Doesn’t that mean that even if I place a Moon there, it won’t hurt me? And then the next player has to deal with my leftover Moon? What if they roll two Moons? How should I play best to help myself? Welcome to the Tragedy of the Commons! You made it. Congratulations. The Tragedy of the Commons is a game theory simulation of a common good and the problems that come when players are able to abuse that good. Imagine that you live in an apartment complex, and one mysterious tenant keeps filling up the shared dumpster with a ruined couch every single week. It’s funny the first time and nothing happens. But the next week, another tenant joins in. Soon enough, there are seven couches in the trash! Now, there’s no space for anyone else to put in their trash, and the garbage company is getting frustrated and responds by increasing their rates in your building. What kind of responses happen when you, as the law-abiding tenant that you are, suddenly lose access to a common good through the actions of others? Do you bring a mob to the parking garage and lay in wait, preparing an ambush of suddenly screaming, angry tenants when that couch-ruiner walks in? Do you simply accept that bad things happen and pay the increased bill? Or maybe you decide that nothing matters at all, and you can join in the couch chaos too! There’s a glorious moment in Rise of Tribes when everyone has been dropping Suns down on Gather so everyone can have a mountain of resources the entire game, and then, with a sudden grin, one player plops down a Moon. They’ve decided to throw a couch in the dumpster. Do you put down a Moon as well, sentencing the Gather action to unlucky doom and gloom for turns and turns to come? Do you fight back and try to salvage the situation with another Sun? Shrug your shoulders and drop a Blank? This might be my new favorite simulation of the Tragedy of the Commons! Rise of Tribes is a fun, fantastic, civilization building game that plays in a relatively quick 30–60 minutes. With plenty of varied Leader abilities, a bunch of different options available in terms of Goals and Technologies, and a string of unique Events that shake things up completely, this is absolutely a game that’s going to show up at my game nights for a long time to come.